The paper deals with a reconstruction of a warp-weighted loom based on a rare find of 36 in situ loom weights in an object interpreted as a weaving hut at an archaeological site Virje-Sušine in Northern Croatia dated in late Iron Age (La Tène C period, 2/2 3rd – 2/2 2nd century BC). The case study includes a theoretical framework for warping based on defining functional elements of different types of loom-weights (thread density, what yarn to use) and study of wear marks on weights which defined the usage. A series of experiments were carried out to define possible distributions of weights in the same loom setup, characteristics of woven cloth, and wooden loom construction. 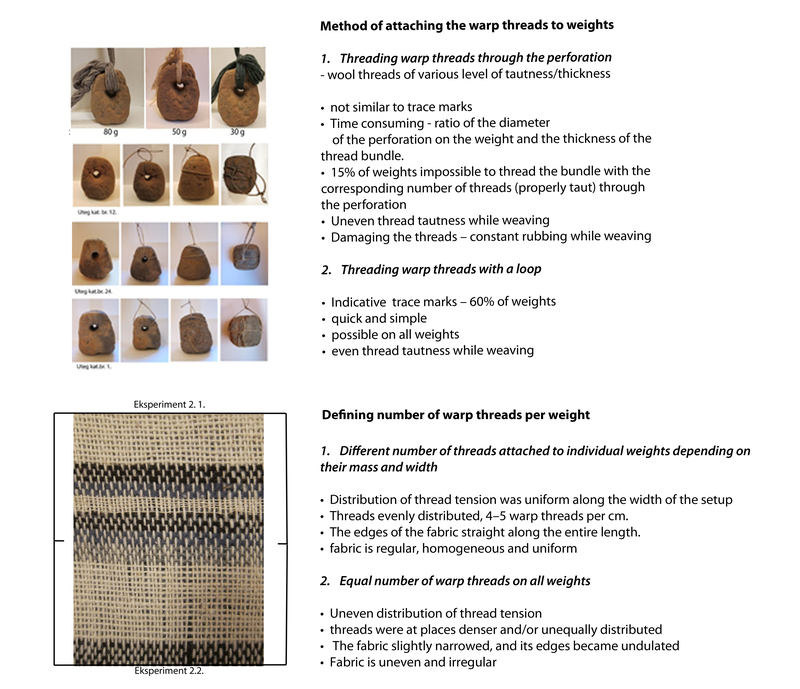 The linear distribution of different types of loom-weights and weights with incised signs within the optimal loom setup showed some regularities which can be connected with technological requirement of producing cloth on a warp-weighted loom but also with design/pattern making. We conducted experimental testing aimed at defining the most probable method of attaching the threads to the weight, optimal choice of thread for a single loom setup, type of cloth that could be produced, method of warping in order to gain an even level of tensile strain, and homogeneous textile. 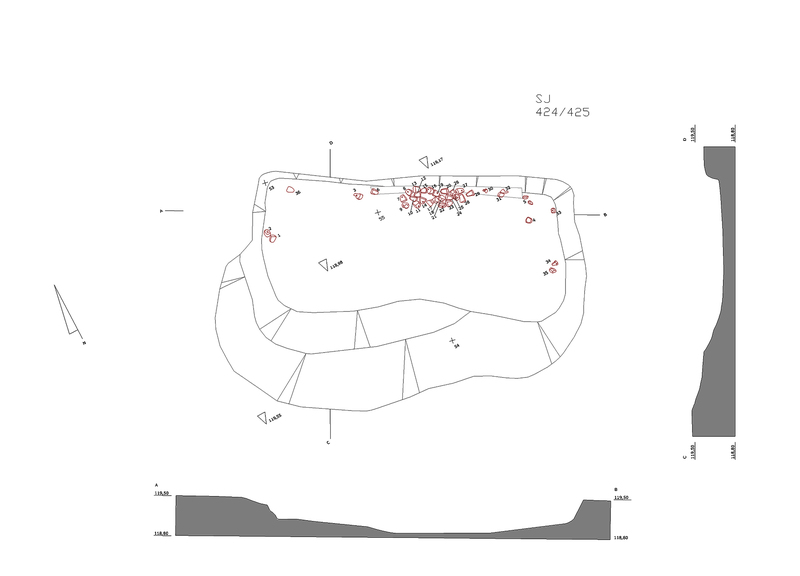 During the excavation in 2014 of an archaeological site Virje – Sušine in northwest Croatia, a large sunken structure of rectangular plan was discovered. (See Figure 1) Its northern part had accommodated a loom, with remains consisting of 36 in situ clay weights. Underneath the weights, a greyish imprint was recorded, presumably the remains of a decayed straight wooden beam that formed part of the loom. The structure, interpreted as a weaving hut is dated in late Iron age, La Tène C period, 2/2 3rd – 2/2 2nd century BC. (Sekelj Ivančan T., Karavidović T. 2016, 175). The clay weights differed in their basic shape and functional elements (weight, width and height). Basic functional elements of a clay loom weight are defined by series of experiments as stated by Martensson (Martensson et al. 2009). 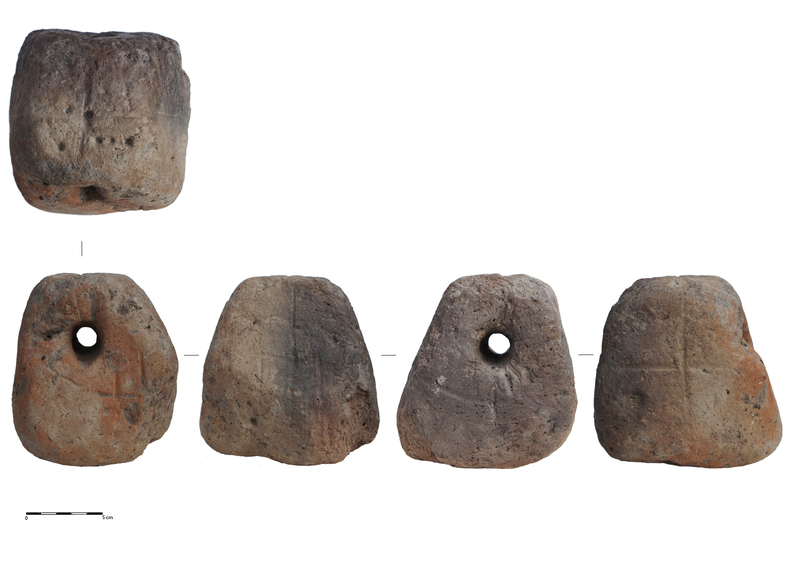 All complete or partially preserved weights with sufficient distinctive elements, were divided into three groups, Type I – III (See Figure 2). Several weights were not fully preserved, and their total mass was calculated on the basis of the volume of their preserved parts. A few weights have incised marks in the form of + on the upper surface and one weight has a unique incised mark in the form of x (see Fig.2). Unique and relatively complex incisions can be seen on upper and lateral sides of one weight. (See Figure 3). Replicas of the weights were made for the purpose of experimental testing. Local (NW Croatia) loam was purified by hand and inclusion of organic material was added (as presumed in original weights). 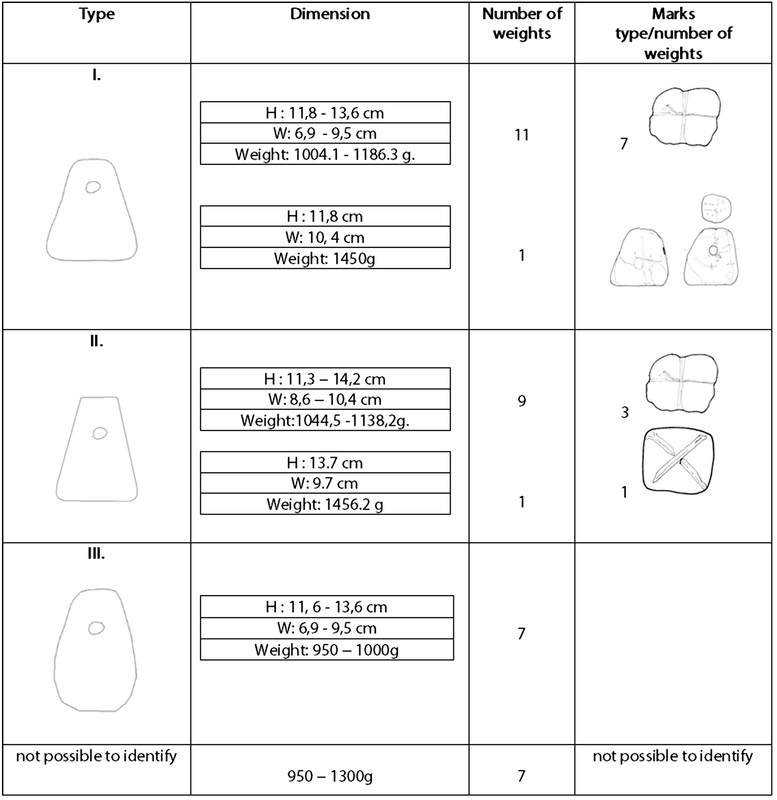 Clay weights were dried and fired in an open fire (See Figure 4). In order to make replicas with matching functional properties as the original weights a few experimental examples of loom weights were made including different percentages of organic inclusions in order to determine the ratio of change in weight and volume between wet, dry, and fired clay weights. Weight and volume of clay weights play a significant role in the weaving process (assessment of optimal thread choice, width of produced textile, etc.). We conducted experimental testing aimed at defining the most probable method of attaching the threads to the weight, optimal choice of thread for a single loom setup, type of cloth that could be produced, method of warping in order to gain an even level of tensile strain, and homogeneous textile. Based on the archaeological record and ethnological requirements of weaving a possible reconstruction of the wooden loom frame was done. Can all clay weights function in the same loom setup, bearing in mind that their functional characteristics differ? Why would a weaver use weights of varying properties (weight, volume, shape) in the same setup? Why do certain weights bear marks and do not differ in other functional properties from assigned types (I – III)? Why are just a few weights much heavier than others of the same shape? 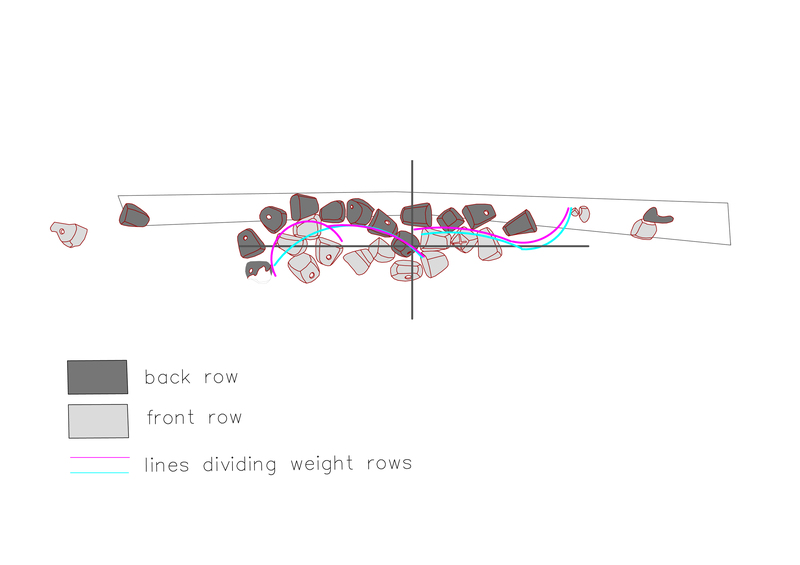 What is the possible linear distribution of weights in a row and could it be connected to the marks on clay weights or/and diversity of morphological features? The loom from Virje, located in the interior of the structure, was probably reclined against or structurally connected with the northern wall of the structure (See Figure 5). The width of the fabric produced on a warp - weighted loom can be the same width or slightly narrower than the width of the row of weights (Martensson et al. 2009, 388). The width of the textile that could be produced with the 28 linearly arranged weights found along the northern edge of the structure is 140 –150 cm (See Figure 5). The maximum width of the fabric that could be produced on the Virje loom if all 36 weights stood in two parallel rows would be between 170 and 180 cm. The wooden construction must have been somewhat wider than the width of textile being produced to make room for inserting the weft threads from the sides. The impression recorded immediately below the densest cluster of weights had a distinctly grey colour, and a rather regular rectangular elongated shape measuring 263 x 20 cm. It is possible that the width of the loom structure was around 80 cm greater than that of the textile produced, and that the impression documented immediately below the weights was a trace of decayed wooden beam of the loom. The width of the loom structure in that case was around 260 cm (See Figure 6). The structure was probably quite a massive one, since during the weaving of a fabric 140–150 cm wide the weaver, by moving the heddle rod, had to move around 16 kg of weights, or around 20 kg for a textile 170–180 cm wide. The reconstruction was made from solid beech tree wood, vertical bearing beams were 10 x 10cm wide. The height of a vertical loom was reconstructed bearing in mind the stability of the construction and the height of the weaver (standing with raised hands – 2.10m). This construction was solid while moving the heddle rods and weaving. It was set inclined to the wall, at an angle of approximately 45º (base 50cm away from the wall). This way, the user could weave around 50 cm of cloth before readjusting the loom (a time consuming process that includes winding the woven cloth onto the beam and readjusting the weights to continue the weaving). A possible linear sequence of weights in a row was made based on the spatial layout of weights in situ (See Figures 7 and 8) A total of 28 weights were found clustered along the northern edge of the structure. 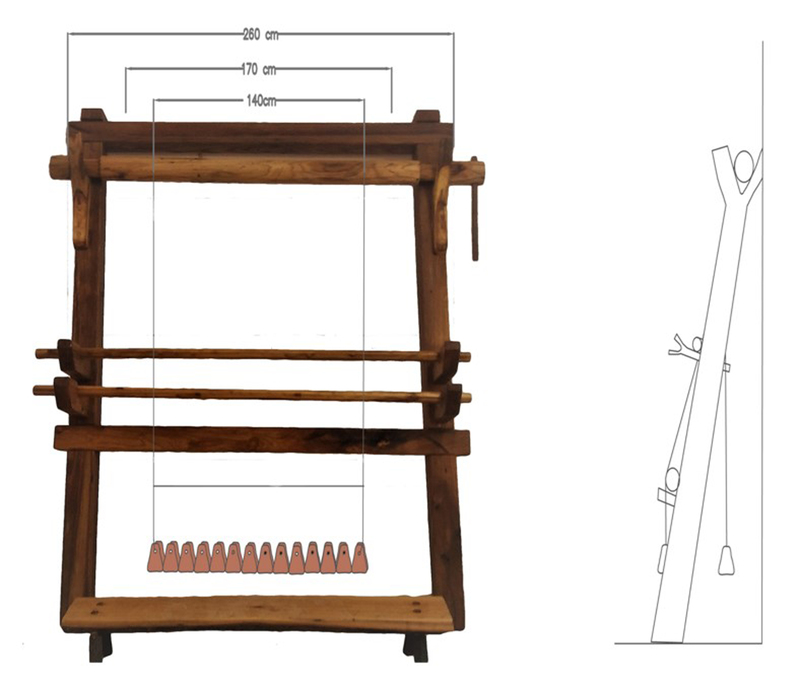 The remaining weights were omitted from this attempt at a reconstruction since their position, documented by the excavation, does not match the linear sequence of weights required by the structural principles of vertical looms (see Fig 1). They may have formed part of the loom setup; however, they may have played the role of replacement weights in case the ones in use were damaged. The symmetrical spatial position of the two pairs of weights along the eastern and western walls of the structure could indicate that there was a minor setup along the lateral edges of the structure, on which a narrow fabric (up to to 10 cm or so) could be made, for instance, the starting border and/or selvedge for the textile that would be made on the vertical loom. 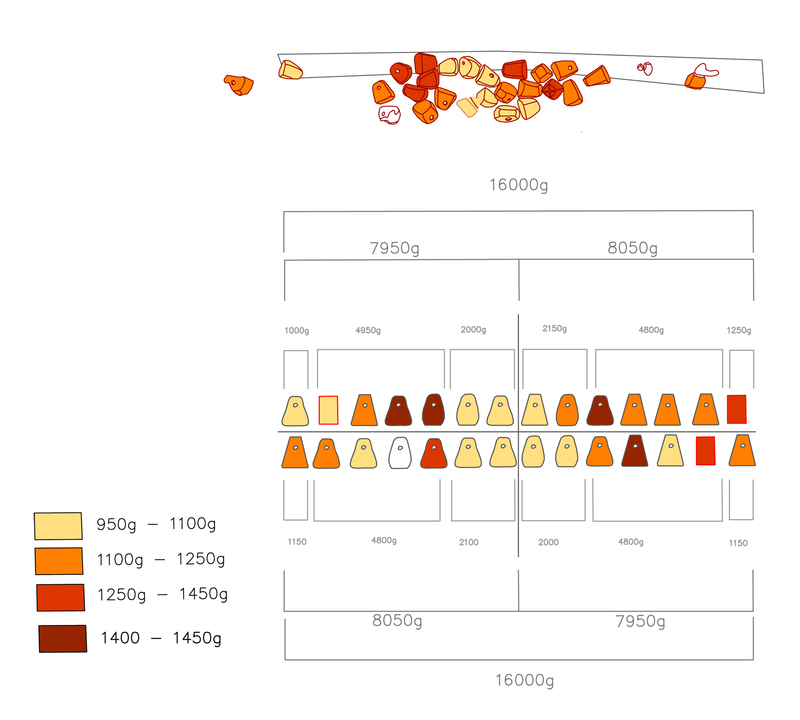 The proposed reconstruction of the linear sequence of clay weights in a row indicated certain regularities in the distribution of the weights such as multiple symmetry and a specific way of gaining balance in distribution of total weight mass on the loom. Although certain pairs of weights (front and back row) show significant differences in their masses, groups of weight pairs are nevertheless regularly and symmetrically (centrally and axially) spatially distributed in both rows in order to achieve an even level of load in relation to the total width of the fabric (See Figure 9). This is partially achieved in the sequence of four pairs of weights. The regular and symmetrical distribution of mass played a role in the technological part of the process of making fabric on a vertical loom. The even and symmetrical distribution of the weight mass relative to the total length of the fabric ensures a balanced level of strain on the fabric as a whole, as well as on the horizontal beam from which the warp threads are suspended. Balanced distribution of weight might also be achieved by a different spatial distribution of weights, for instance, by alternating placement of heavier and lighter weights in the sequence. A specific spatial organization seen in the presumed reconstruction may have been caused by the unavailability of more suitable weights, by specific technological requirements for organizing a uniform level of strain, but also it could be a result of managing technological requirements with the predestined position of certain weights (those bearing a mark or/and morphologically different types). Weights with marks are placed centrally symmetrical with respect to the point made up of the middle weights (See Figure 10). The distribution of weights of the same type within the same space is also symmetrical, while the weights outside that space are not symmetrical. Two weights with unique marks by virtue of their position form part of that regular sequence, however, their position is at the same time conditioned also by their weight. Additionally, they are positioned at the same place within the sequence of weights and stand centrally symmetric to each other. We may presume that morphologically different weights were deliberately produced with the aim to make a specific type of fabric, and their dissimilarity was aimed at facilitating the complex procedure of setting up the loom. The shape of the weight pointed at its mass, which was important for choosing the position of the weight and for attaching the appropriate number of threads. 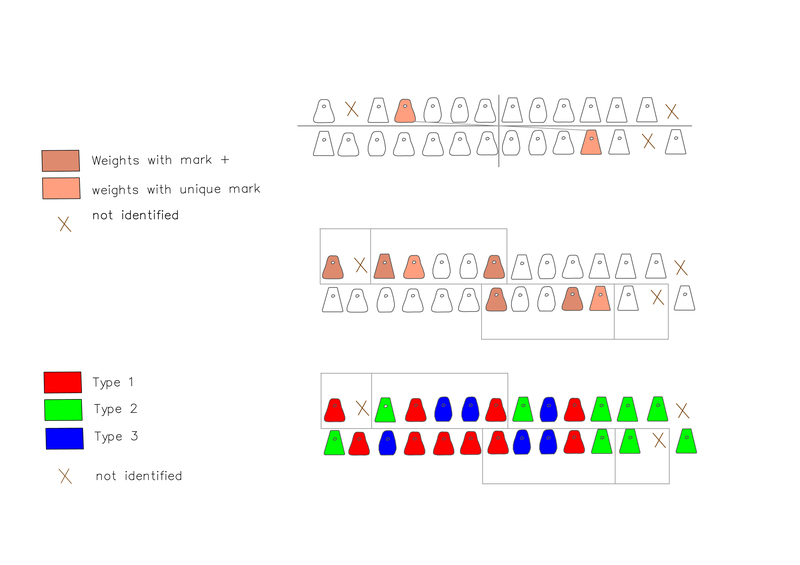 Symmetrical series of morphologically different weights in the same space, as well as of marked ones, suggest that they may have played a role of marking the parts of the fabric to be executed in e.g. different colour, pattern, technique etc. The fact that typical representatives of type I and II, have the same mass span (from 1000 to 1150–1200 g) also speaks in favour of this. Additionally, we ought to single out the weight which bears unique shallow incised marks on top and lateral sides. Its role, in the context of these assumptions, might have to do with the way the loom ought to be set up in view of the requirements of producing a specific type of fabric. It might relate to the spatial layout of the weights and/or features of the textile being produced. The first question at hand was what kind of thread to use in a loom setup based on functional characteristics of clay weights from Virje and what is the method of attaching the warp threads to the weights? Also, could all the loom weights stand in the same loom setup if a uniform thread was used, as they have different functional characteristics? A theoretical framework was done based on guidelines shown by systematic experiments with weights of various size, mass and shape (Martensson et al. 2009: 373–398, Andersson Strand 2010: 211). Different types of warp, depending on the thickness, method, and level of preparation of the raw material, quality and other parameters, require a certain level of tension in order for the weaving to be properly done. The tension of the warp threads has to be evenly distributed across the full width of the textile in order to obtain a homogenous uniform textile without irregularities. The calculation was made for weights of typical features within the defined types, as well as for weights deviating from the average values within individual types, in order to obtain the maximum range of possible values (Sekelj Ivančan T., Karavidović T. 2016, p.182, Tab 1 – 7).. By overlapping the results of specific values it is possible to determine whether these weights may have been used in the same setup and what types of threads would be the optimal choice. The results indicated that the observed group of weights can be used in the same loom setup while possible tensile strain values are between 30 and 80 g per thread. Optimal choice for all weights in the same setup was a warp thread requiring a tension of 40 or 50 g. In the optimal case, the weights put together were intended for making a specific type of fabric with 4 – 6 warp threads per centimetre. In the weaving experiments we used single-thread industrially produced wool without synthetic inclusions that required tensile strain of 50g per thread, with a thickness of 1–1.5 mm when taut. The textile was woven in tabby weave, which is considered the basic, simplest technique. It was used during the Neolithic, Bronze, and Iron Ages. Based on the known textile finds from Eastern and Western Europe; this was probably the most common technique in the Late Iron Age (Bender Jørgensen 2005, 134, Fig. 1–2; Belanová Štolcová, Grömer 2010, p.16; Bender Jørgensen, Grömer 2012, p.100, Fig. 7). The result was a densely woven textile, with 3- 4 threads per cm. The woven textile was 140 cm in width. Experiments showed that in order to obtain an even distribution of strain throughout the full width of the warp, different numbers of threads needed to be attached to groups of weights with similar properties (See Figure 11). Wear marks seen on 60% of weights indicated that bundles of warp threads were attached to the weights indirectly, through a loop. Experimental testing of direct and indirect ways of attaching warp threads indicated the same (See Figure 11). Setting up a loom is a complex process requiring forethought, an understanding of the consequences of each individual action, as well as a degree of experience and knowledge. 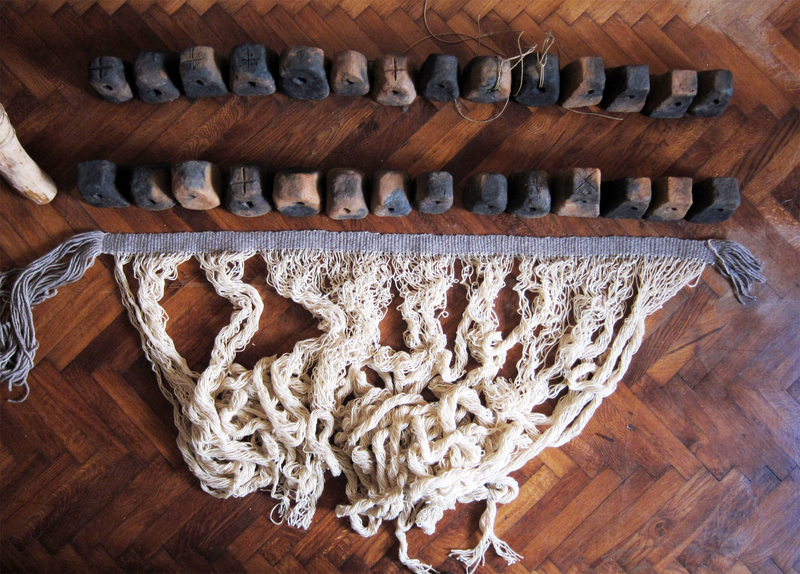 The results of the conducted experiments and theoretical reconstruction of distribution of clay weights in a single loom setup, indicated a specific and complex system of warping a loom. The system is presumed to be in a relation to predefined positions of certain weights (those bearing a mark and of specific shape) and technological requirements of producing a specific type of textile on a warp - weighted loom. Furthermore, the archaeological context of the find indicates that the structure in which the weights were found can be interpreted as a weaving hut, a working space dedicated entirely to weaving. Belanová Štolcová, T., Grömer, K. 2010, Loom-weights, Spindles and Textiles – Textile Production in Central Europe from the Bronze Age to the Iron Age, North European Symposium for Archaeological Textiles, Vol. X, 9–20. of Central Europe, in: Hallstatt Textiles: Technical Analysis, Scientific Investigation and Experiment on Iron Age Textiles, Bichler P., Grömer K., Hofmann-de Keijzer R., Kern A., Reschreiter H. (eds. ), BAR International series 1351, Oxford, 133–150. Bender Jørgensen, L., Grömer, K. 2012, The Archaeology of Textiles –Recent advances and new methods, Portal, godišnjak Hrvatskog restauratorskog zavoda, Vol. 3, 91–111. Understanding a Loom Weight, Oxford Journal of Archaeology, Vol. 28, No. 4, 373–398. Sekelj Ivančan, T., Karavidović T., 2016, A loom from Virje, Prilozi instituta za arheologiju, Vol 33, 171 – 237.